1. What is the conservation status of the Richmond Birdwing butterfly? 2. What was the original range of the Richmond Birdwing Butterfly? 3. When is the flying period of the Richmond Birdwing Butterfly? 4. How long does the butterfly live? 5. What is the best way to identify them in flight? 6. How big are the butterflies? 7. What is the scientific name for the Richmond Birdwing Butterfly? 8. How far can the butterfly travel? 9. How do the butterflies find the vines? 10. How does the butterfly know to lay her eggs on only that vine? 11. How many eggs does the female butterfly lay? 12. How long does it take eggs to hatch? 13. How long do they take from egg to butterfly? 14. How long do they stay in larval stage as caterpillars? 15. How big does the caterpillar grow? 16. What does the caterpillar look like? 17. What is an instar, and how many does the caterpillar have? 18. What is the osmeterium? 19. How long does the pupa stage of the Richmond Birdwing Butterfly last? 20. Why has the caterpillar left the vine? 21. What does the chrysalis or pupa look like? 22. What are the enemies of the egg? 23. What are enemies of the larva? 24. What are enemies of the pupa? 25. What are enemies of the adult butterfly? 26. Why is the Dutchmans Pipe vine dangerous to the butterfly? 27. What do Richmond Birdwing butterflies feed on? 28. Are the males territorial? 29. How come the caterpillar does not die by eating poisonous vine? 30. What is the difference between the pupa and the chrysalis? 31. How do I get a permit to grow vines? 32. Is there any point in planting the vines at Maryborough? 33. What is the status of Pararistolochia praevenosa vine? 34. Where does the Pararistolochia praevenosa vine occur naturally? 35. Why are the Birdwing vines disappearing? 36. Does the Birdwing larva only feed on P. praevenosa? 37. What is the best way to identify the Birdwing vines? 38. How big do the birdwing vines get? 39. Why do the leaves vary from one vine to another? 40. What do the flowers look like? 41. When do they flower? 42. Do butterflies feed on the Pararistolochia flowers? 43. What pollinates the flowers? 44. What do the seed capsules look like? 45. How long are seeds viable? 46. How are seeds dispersed? 47. Can you take cuttings off vines? 48. Will caterpillars strip the vine? 49. What is the difference between Aristolochia and Pararistolochia vines? 51. How much light is needed to grow the vines? 52. What soil conditions are needed to grow the vines? 53. How much water do the birdwing vines require? 54. Can mulch be used to help retain moisture around the vine? 55. Where should the vines be positioned? 56. At what time of the year can the vines be planted? 57. What are some recommended trees to grow the vines up? 58. Can the birdwing vines be grown with other native vines. 59. How long does it take them to flower? 60. How fast do the birdwing vines grow? 61. Can the vines be planted in livestock paddocks and is it toxic if eaten? 62. Where can I purchase good quality vines? The original range of the Richmond Birdwing Butterfly at the time of European settlement was considered to be from Maryborough, QLD in the north to Grafton, NSW in the south and west to the Great Dividing Range. In the warmer months the butterflies fly from September to April. At lower altitudes, the adult butterflies emerge between September and November and then from January-March when temperatures, humidity, and rainfall are high, and the days are long. Adults are most abundant from September – November and again February – April, although this varies slightly between different regions. While there are two breeding periods at lower altitudes, there is only one at higher altitudes. The adult butterfly lives for approximately 4 to 6 weeks. This large butterfly has a yellow body with a red thorax (both the males and females). The red and yellow colours on the thorax are a defence mechanism for the butterfly. The warning colours are a sign of toxicity to most predators. Males upper wings are an iridescent green and black in colour, the underside is blue, green, yellow and black. Females are dark brownish in colour with white and yellow patches on both upper and lower wings. Males have a wingspan of 12 to 13cm. The Females wingspan is about 14 to 16cm. They can vary in size depending on whether they are the spring generation, which are usually smaller, or the summer and autumn generation. Also the size of the larvae when pupation occurred can determine size. The Richmond Birdwing Butterfly is one of the largest butterflies in Australia. Research has shown that the male will travel up to 4 kilometres from where it pupates while the female will travel up to 30 kilometres from where it pupates. The vine contains pheromones which the butterfly can detect from at least a few kilometres away. The female will come in and lay her eggs only on selected leaves that are at the exact right stage for her caterpillars to feed on when they hatch. She does this with receptors in her forelegs. The female tests the viability of the leaf with her feet. But she can be conufsed into laying eggs on the poison Dutchman's Pipe vine (Aristolochia elegans). She can lay 60 to 100 eggs, depositing them on different leaves and vines. About 10 to 13 days. Any longer and they probably will not hatch. The little caterpillars first meal will be its own egg shell. About 2 months during summer (in non-diapause). When smaller they are black but change colour as instars occur. Colours can vary from pale grey to black. They have two opposing rows of soft fleshy spines along their back, the central pair being bright yellow. In larger caterpillars all the spines, except the yellow ones, are tipped with an orangey red colour. 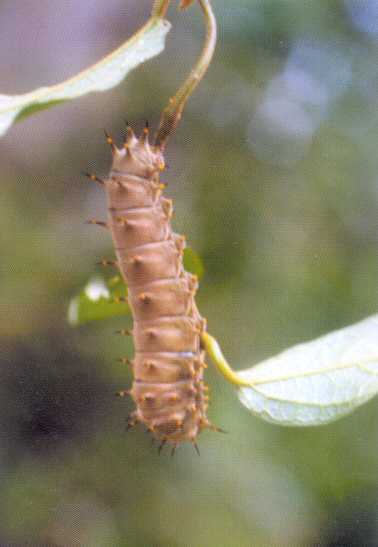 An instar is when the caterpillar sheds it skin in order to get bigger. They can have many instars, four, five or even six. The more they have, the bigger the caterpillar will be, therefore the bigger the butterfly will generally be. Every time a caterpillar has an instar it will be slightly different in appearance. The osmeterium is extruded from behind the head of the larvae when disturbed. It helps to ward off predators. It is yellow, forked shaped and has a jelly - like appearence. Osmeteriums are only found on Swallowtail species. When full grown, a larva will find a "special" spot to pupate - under a leaf, but not often on the food plant as it would risk cannibalism by another larva. After weaving a silken girdle and attaching itself by the tail to the leaf (by a "cremaster"), the larva shrinks to become a grey-brown "pre-pupa". After a few days (usually 2) the skin splits and the pupa (green in colour) pulls free from the dead skin and re-attaches itself to the leaf, held by cremaster and central silken girdle. The pupa remains very still (tiny wriggle sometimes!) as the butterfly develops inside it for about 28 days (during warmer moths & depending on temperatures in spring, summer or autumn) or up to 250 days (in "diapause" over winter, depending on rainfall cycles and temperatures). In a normal spring, the spring emergence of adults occurs in September and October, but sometimes extends till December when drought prevails. There are approx. 2 generations of adults per year with a litle overlap during drought periods. Further information can be obtained from the book "Conservation of Birdwing Butteflies" edited by Don Sands and Sue Scott. They can leave the vine to have instars or to pupate. They can travel a great distance. This is a defence mechanism so other siblings do not eat them as they can be cannibalistic. The Richmond Birdwing Butterfly chrysalis is always green, and is about 3 to 4 cm long. It attaches it’s rear legs to the leaf, and suspends it’s upper body with a girdle made of silk. Long-legged red mite, ants, soldier beetle. Ants, soldier beetle, pentatomid bug, assassin bug. Pied currawong, noisy pitta, wasps. Flower spiders, orb weavers, wasps, noisy pittas. Dutchmans pipe (Aristolochia elegans) is a native to South America. This vine tricks the Richmond Birdwing butterfly into laying its eggs on it but it is toxic to the larvae and will kill the caterpillars. This is a major threat to the Richmond birdwing. Bottlebrushes, and Leptospermums or plants with small bell shaped flowers. Exotic species also used are buddleia, pentas, bauhinia, bougainvillea, honeysuckle, agapanthus and impatiens. The butterflies are versatile and will feed on whatever is flowering and available at the time. Yes, they will guard their territory from other males for the best position. The strongest and biggest males will win. They patrol these territories looking for females and food, and nearly always follow the same flight paths. P. praevenosa is not a particularly poisonous vine - there are about 14 + described aristolochic acids and this one is quite low in toxicity for vertebrates. Second, in the 25 million years or so it has taken for butterfly and plant to co-evolve, the larvae have developed specific enzymes that break down the toxins and use them for food - except for Dutchmans Pipe where the 2 did NOT co-evolve in Australia! This is a common situation in "old" Australian insects, many of which have only one, or a few food plants, and where their guts have evolved over very log periods of time, and to be immune to otherwise toxic plant compounds. Think of the Wanderer - it has the ability to break down the toxic milkweeds! The words pupa and chrysalis both describe the stage that a fully grown larva changes into before emerging as an adult butterfly. Contact the EPA in your area to make an application. You can apply on behalf of a community group (non profit), or you can apply for a commercial permit, the latter incurring a charge. Yes. Mary River Heads was the most northerly recorded location of Pararistolochia praevenosa vines growing in the original range of the Richmond Birdwing Butterfly. 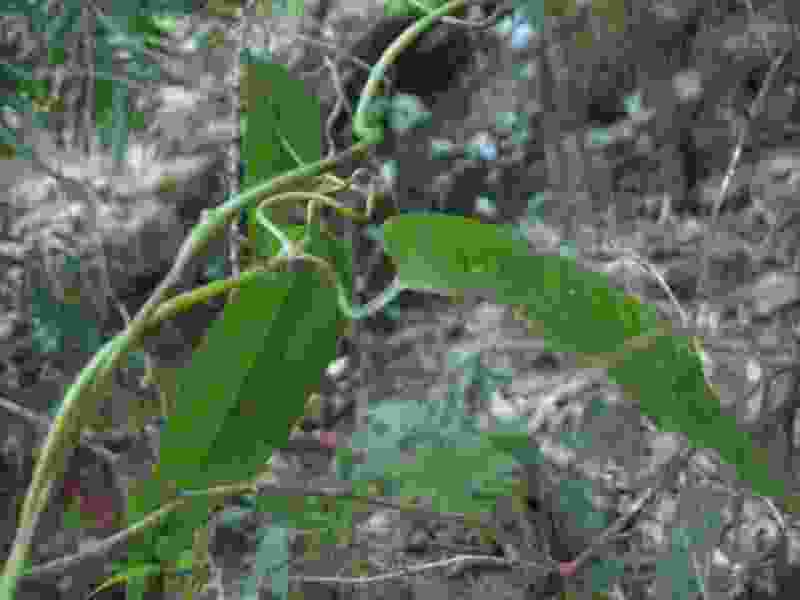 Note that there are records of wild P. praevenosa vines growing on the Atherton Tableland, but this area is well outside of the range of the butterfly. The the mid 20th century, the range of the Pararistolochia praevenosa vine, commonly called "Birdwing Vine", was from Mary River Heads in Queensland to Grafton in NSW. It grows mainly in subtropical and littoral rainforests and also gallery forests. Two thirds of its original range has been lost and is still declining due to land clearing and urbanisation. Without this vine the Richmond Birdwing butterfly will cease to exist. They also feed on Pararistolochia laheyana which grows at higher altitudes, usually above 600 m but it has been found as low as 400 m. It is sometimes called the Mountain or Montane vine. While P. praevenosa and P. laheyana are the only known larval host vines, the larva may feed on other native Aristolochia vines growing within the range such as A. meridianalis, but there is no scientific evidence to support this. Attached is an image of P. laheyana. The leaves have a sandpapery texture which alternate along the vines stem. The petiole, which joins the leaf to the stem of the vine, is about 1-3cm long and hook shaped. The petiole also extends ¾ around the stem and is slightly ridged. The bark has a distinct cork-like appearance. Stems on mature vines are ovular shaped. They also have very unique flowers that are easily recognisable. On most leaves the base vein runs more than half way down the length of leaf. It is a rainforest vine. It can ascend 20+ metres up into the trees canopy when fully mature. In a garden situation it only usually reaches up to about 10 metres. This is called phenotypic plasticity variation. This means the vines all have the same DNA but due to environment variances, including location, positioning, temperature, soil, rainfall etc, the leaves vary in size, shape, texture and colour, but overall they are all still the same vine. Flowers are a 2.5cm long pinkish tubular shaped flower with a bright yellow inside. Late September to December but can be sporadic. Seed capsules ripen over summer and then fall from the vine when ready in autumn. No they do not. The flowers contain no nectar. We believe unidentified minute flies are responsible for pollinating the flowers of the birdwing vines. It is thought that the flowers give off the pheromone that attracts the flied into entering and pollinating the flower. It is thought that these flies live in the moist leaf litter and are non-biting. Unfortunately to get the scientifically proven would cost hundreds of thousands of dollars and is unlikely to be done. They are orange, oval shaped capsules with a fleshy centre and can contain over fifty beige coloured heart shaped seeds which are about 7mm wide. Up to about 3 months. In nature the ripe seed capsules are broken up by the Australian Brush turkey (Alectura lathami) or by falling from heights. If the capsules are not broken up they will not germinate. Seeds that pass through the gut of the Brush turkey are not viable. Yes you can but they are usually slow growing and the success rate is not good. No because the caterpillars do not eat the old hard leaves .This protects the vine from being stripped. Also the young shoots are not eaten by young caterpillars as they are poisonous. Labels and references have been known to be written both ways but the true way to tell is by seed dispersal. Aristolochia has seed pods which split open unaided and disperse windblown seeds. Pararistolochia has seed capsules which need to be fractured to release seeds and they are not wind dispersed. Tagala vines, originally from North Queensland, are not good for the larvae of the Richmond Birdwing Butterfly. Read the associated document by Greg Siepen to find out why. Good growth is achieved in partial sun to semi shade. Leaves grown in a lot of sun get tougher quicker, whereas leaves receiving more shade are softer and have more edible leaves. Moist, fertile and well drained soil is preferred. Use water crystals in dry areas. Do not plant under pines or cypress as soil is highly acidic. The ideal PH is about 6.8. Water in well when first planted. Water weekly for the first year to help get it well established. Mulch well with any organic mulch, but not eucalypt or pine. Keep mulch away from the stem to prevent rotting. Mulch also supplies habitat for pollinating midges and helps to control weeds. Try to position vines on the edge of the north eastern side of the rainforest or tree and on the outskirts. This allows the vines to receive good amounts of light which are needed for the vines to grow and flower well. The butterflies benefit from this positioning also because the vines are easy to access and they can also stay warm in the sun, which is important because butterflies are solar powered. Protect the vines from strong winds and frosts. Treeguards, wire, rocks or logs around the base of the vine will help to protect plants from mechanical disturbances and also makes them easier to identify and maintain. Planting vines on the trees drip line is also good. Plant at least 1m or more away from the tree or structure and at least 1m apart from each other. Protect newly planted vines in lower or flood prone areas of creek lines by planting at the back of the suitable trees where the water flows around and by weighing it down with rocks around the base. Planting can be done all year round. Dig a hole about 30cm by 30cm, do not tease out the roots, or heal in. It damages growing root tips and inhibits healthy growth. Place in hole at ground level and gently backfill with soil. Non deciduous local native trees are the best. Trees with large spreading canopies are ideal. Sandpaper figs, Lillypillys, Blackbean, Euodia, Myrtles or any large trees which do not regularly shed bark or drop branches . Propagation (either natural or cultivated) is slow up until they produce leaders at about 2 years old. After that they are quick to establish given the right conditions. They are a steady growing vine and it takes them a long time to get large. They can be pruned if needed but not recommended. They can be grown on trees, fences, pergolas, verandas, or anything for support. They are a non invasive rambling vine which means they do not attach themselves to structures. They use leaders and the hook shaped petioles to climb, so rope, twine, bamboo, wooden stakes (or anything that will not rot) can be used to train the vines up. When training the vines remember that the tendrils will always grow anticlockwise up the stake. They are a clean non-deciduous vine which does not drop many leaves at all. Remember, these vines can live for 100 + years and will support many generations of butterflies, so try to position the vines somewhere where you can see them regularly, look after them, and appreciate the magnificent butterflies they will attract. No its not toxic. It is best to fence of an area if planting in livestock paddocks to prevent vines being trodden on.